Marte rides a WorkCycle with her two boys Mateo, 7, and Arlo, 5. They have a Yepp child’s seat in the back and an extra regular seat for her son up in front. They wear Lazer helmets. Marte: We ride four miles to the boys’ school — there and back. In the winter, we just wrap up. For me, it’s never that cold because it’s such a workout. For Mateo sitting in front, I make sure he has a face mask and real ski gloves. I grew up biking in Germany. I biked to school every day from the time I was 6 or 7. My parents would never drive us, except maybe in the hardest winter snow. You have your rain outfit and you’d bike. It’s fairly normal. Downhill we’re unstoppable, there’s just so much weight, you’re flying! Uphill is a killer. I tell them, I’m not going to be able to talk until we’re at the top of the Brooklyn Bridge. Once Mateo paused for a few seconds and then asked me, So, Mommy what happens when you die? Seriously, he chose that moment. Our deal is that they’ll ride me around when they get bigger. After all these miles that I’ve ridden, they owe me. 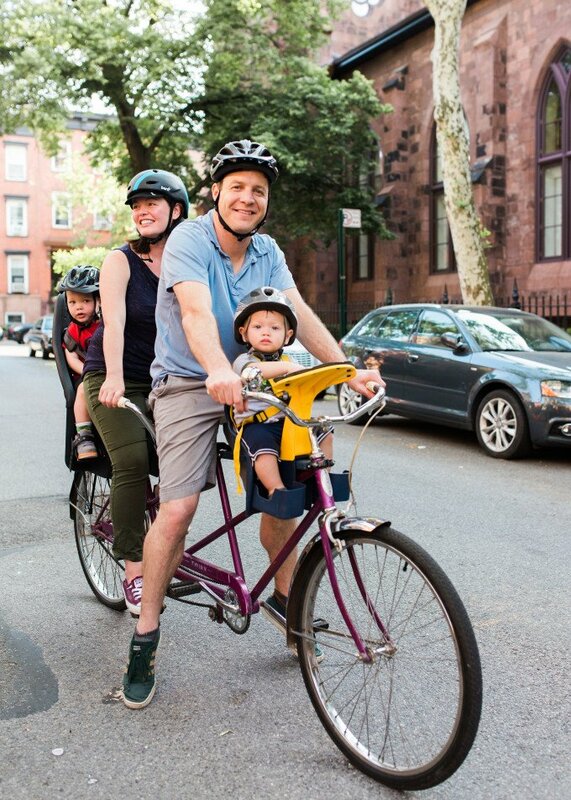 Megan and Mark ride a vintage Schwinn tandem with their sons, Ryan, 2, and Drew, 1. Mark: My grandmother asked for a convertible for her 50th birthday, and her husband gave her this Schwinn tandem instead. My mom then got it as a hand-me-down, and my sister and I rode it growing up in Connecticut. We used to deliver newspapers off the back. I’m the motor of the bike. Megan gets nervous riding on the city streets. She shuts her eyes! Megan: I’m awful on bikes, but this allows us to ride as a family. I’d never feel comfortable biking with kids or even on my own. We did the Five Boro Bike Tour on this. It was 40 miles. We get so many comments. In fact, when we don’t get commented on, I get annoyed! 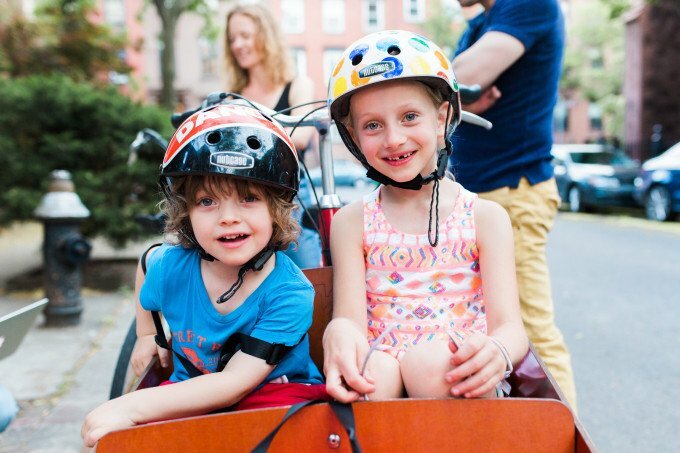 Graham and Charlotte ride a Dutch bakfiets, or cargo tricycle, with their kids, Hannah, 6, and Alexander, 6. Graham: We brought the bike over from Holland, where we rode with our son from birth — his car seat was strapped in with a bungee cord. It was really secure. We took him everywhere. It’s not that heavy. We did Williamsburg to Prospect Park a couple weeks ago — 14 or 15 miles. It’s easier than you’d think. Charlotte: When the kids aren’t with us, we use it for groceries. We had 160 pounds of sand in it the other day to fill our sandbox in our garden! Graham: The kids chat and look at things; that’s the nice part about having them in front of you. Charlotte: We mostly tell them to keep their hands in. 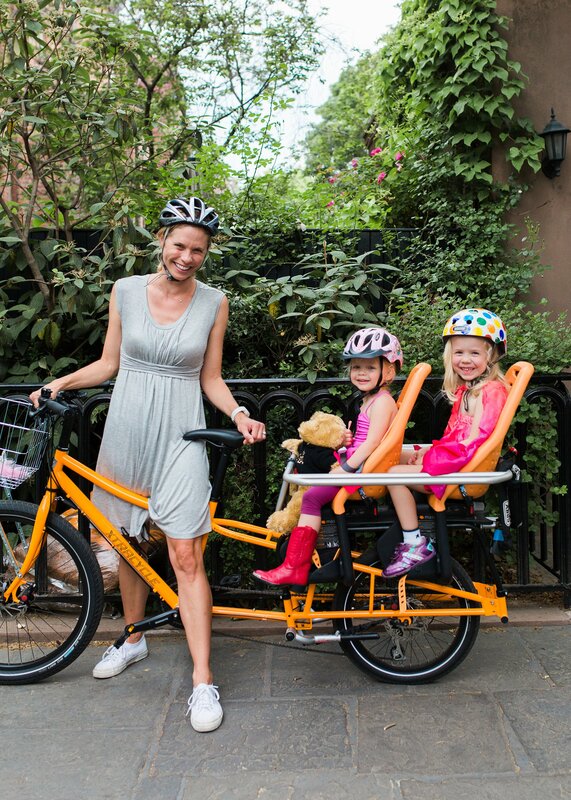 Kim rides an Xtracycle with her daughters, Ella, 5, and Grace 3.5 — and soon Jack, 1, will join, too. Kim: I’m at home during the day and my hope is to be a power mom and take all three kids around on the bike. It’s definitely a new, exciting thing for us. We love going to the Brooklyn Waterfront in Dumbo. Riding in Prospect Park is magical, because you don’t have to worry about cars or traffic. The kids always direct me — “Let’s go into the woods!” — and we’ll turn down a winding path with the wind in our hair. Having the bike opens up the city in a way that we wouldn’t get to experience otherwise. 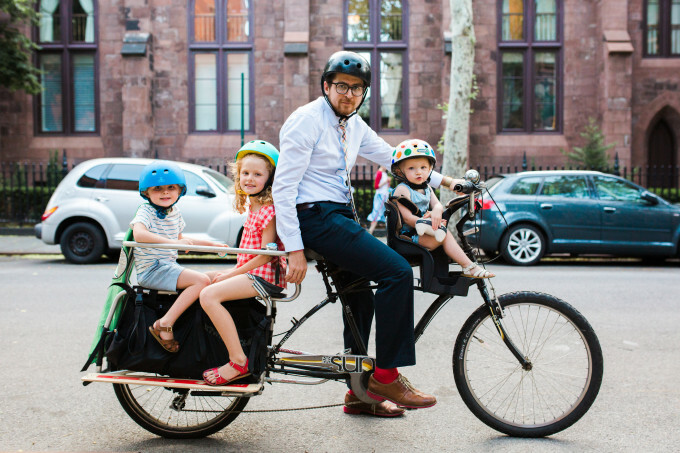 Brian rides an Xtracycle with his three kids — Ivy, 7, Oliver, 4, and Rosie, 2. Brian: The bike’s instructions said it would take two to four hours to build, so one night when my wife Linsey was out, I decided to surprise her. Of course it took closer to 10 hours over two days, so she came home to a living room that had been converted into a bike shop… let’s just say I’ve given her much better surprises in our 10 years together. But she has forgiven me and now she loves it. We love riding to parks and cruising the streets of Red Hook. Also not gonna lie, we spend a fair amount of time at IKEA — the parks out back are pretty awesome, not to mention the 99-cent breakfast and meatballs. Basically everything kids do in cars — including fighting with siblings — they’ll do on the bike. Ivy has taken to reading on the bike lately. It’s my dream to ride our whole family around. We tried it once, but Linsey cut the ride short because she was nervous I’d crash. Not sure how I will coax her back on there, but I’m hopeful it will happen again. We recently took a family vacation to Amsterdam. Bike hitchhiking is a thing there, with people sitting on the rear racks of bicycles. I’ve thought about offering rides to people headed to Manhattan after I drop my kids off at school. Maybe we could start that here. The bikes are so inspiring! I would love to do something similar when Toby and Anton get a little bigger. 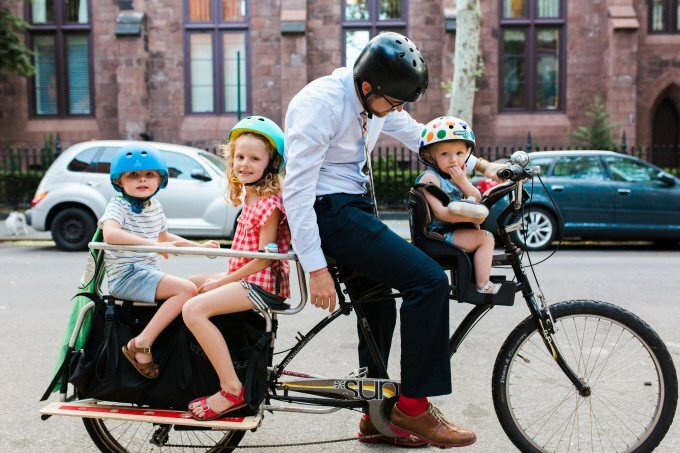 Even when they learn to ride their own bikes, we will still use my bike like a car, for long rides and commuting, so it would be awesome to figure out a new set-up like these. Thank you so much! I would have loved one of those Xtracycle’s when my kids were little! What a wonderful thing for families to enjoy. Too bad they’re both taller than me now, or I would suggest it, hahaha!!! This is so awesome thank you! Hoping to get a cargo bike for me and my two babes. Recently in Israel, I noticed many riding electric bikes. I believe these bikes give an electric assist when necessary. Also recently in NYC and was surprised to not see any of these bikes. We actually rented bikes in Central Park and it was quite fun. Can’t imagine trying to ride through the city but riding through the park was amazing! We are a very excited new biking family! We went with a bike trailer for our kids and its working well so far. However, I am incredibly inspired by all the other options for biking with kids! Hi! 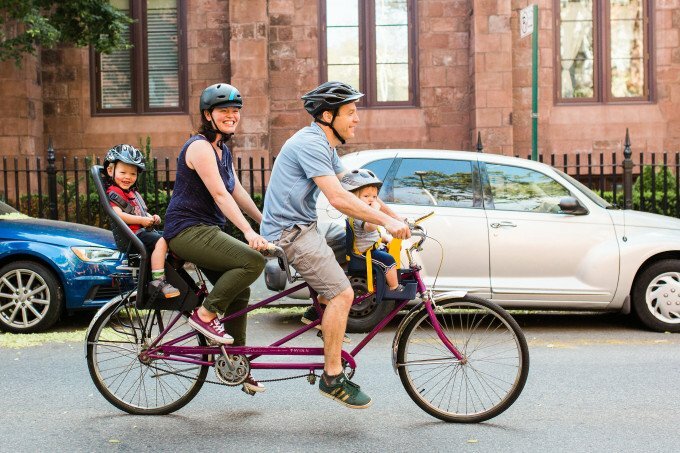 Bikey families are growing in numbers! I’m so happy to get a glimpse of the east coast version of family biking. We live in Seattle, and have a strong and growing family biking community. 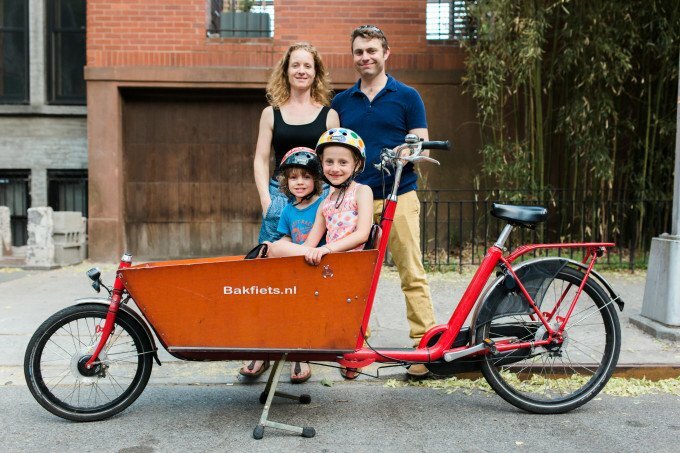 One thing which needs correction in your post is that you’ve photographed a family with a Bakfiets, and called it a cargo tricycle. It’s not a tricycle, and definitely only has two wheels. Bakfiets translates as Box Bike. Fiets is bike, and is singular. There are cargo trikes, and some are front-loading, with a box, but the wheels are situated quite differently, and they aren’t true bikes. I think it’s worth editing your post, so families who are just starting out won’t get confused. Sara, biking with my family in Seattle. Wow, awesome. Thank you for sharing. One thing that you did not address which is crucial for families living in cities is how to store a cargo bike (or any bike) in apartments. I would love an xtracycle to cart my kiddos around DC, but we live in a walkup with no bike storage (and if there was storage it would still involve stairs). It’s hard enough to carry a car seat or stroller up and down the stairs. Maybe a post on creative bike storage (we currently hang our bikes vertically in a closet)? Wow, these all look so amazing! Thank you for the inspiration. I especially like the bakefiet and Xtracycles. Fun to meet these families and see different set ups! We love our Xtracycle Edgerunner. I’m on the lookout for an electric bike which will allow me to bike with my 10 year old daughter who has special needs. We had to sell our trailer when she got too big and we haven’t done any family cycles since. ? The Xtracycle EdgeRunner 10e with a Hooptie is another option for safely carrying your daughter. WONDERDUL Article!! We have an xtracycle Edgerunner in Seattle and use it almost exclusively! Awesome investment in family QT, fun and clean air! We cover ALL of San Francisco via Xtracycle, rain or shine! I honestly hate getting back into a car now. Truly my favorite thing to do with our daughter. And how does a car compete with random hugs from behind, while riding?! We’ve been living car-free with our two kids for the past three years. I ride a Bike Friday Haul-a-Day and it’s perfect for getting around–fits everything we need and is still small enough to maneuver and store easily. It’s great to see so many biking families! Normalizing bikes as a valid form of transportation is necessary to help show others how doable it can be. What a fun, inspiring post! 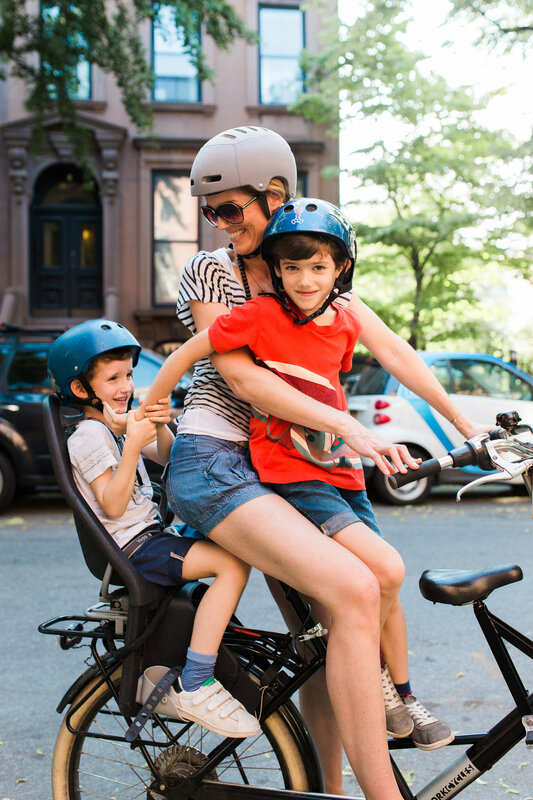 This is tricky to pull off in all but the most urban settings in the U.S, but I daydream of a family bike instead of a minivan all the time : ) Can’t wait to see photos of you and your boys on one soon, Joanna! So when I turn 50 & ask for a convertible, I hope my husband gets me a vintage purple tandem bike! Yes, we love our Yuba Mundo! It fits all three kids (7, 4, and 1.5) and we typically bike to school for drop off and pick up. It is our schoolbus! I LOVE this and would also love to see it as an ongoing series. My husband and I were in Amsterdam over Christmas and even though it was absolutely freezing we rode bikes everywhere. The biking culture and infrastructure there is AMAZING. We ride our bike every day – with the Baby in the back seat and our 5 year old daughter riding her own Little bike now. This is a very usual Thing to do though here in Hamburg, Germany. You see a lot of cargo bikes like Christiania or Bakfiets. They are awesome! But also expensive and they take a lot of space and a dry place to ‘sleep’. On top of it, unfortunately many bikes get stolen so we’ve decided for the ‘small’ solution and are really happy with it! This is the most relaxing and happy way to travel the city with children! I love this! My husband and I bike everywhere here in Bern, Switzerland and I love seeing people with kids on their bikes. It’s more common to see people pull them in a chariot behind the bike as opposed to on the actual bike, but I still love that they take them along. 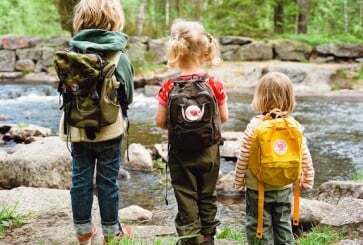 These families are so inspiring! Yes! One of my favourite posts ever! Such beautiful families and cute, cute bikes. I’m so inspired, Joanna. Just need to get my confidence up. Also, have you seen the photos of Princess Mary with her family bike riding around in her Nihola cargo bike in Copenhagen? She looks so chic! The bicycles are all over Copenhagen – it’s the way to get around with kids in Cpenhagen. The Christiania bikes are especially popular! Very cool bikes – I sure wish I had a bike like these when my kids were growing up! One of my favourite posts ever! I ride every day with my 18 month old son in a seat on the back of my bike. 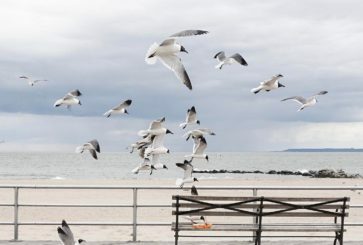 I love the freedom it gives me, and also the connection he has with the outside world, rather being shut behind windows and locked doors. He waves and gabbles to strangers along the way, spots dogs or fountains and whoops. I’d be terrified to do the same in a U.K city where drivers can be so pushy and anti-cyclists. Plus the roads are so narrow. We currently live in Asian country where most children are dropped off at school on a bike, until they progress to riding themselves. It’s not an anti-car movement, it’s just cheap and convenient and everybody rides bikes here. Bike lanes are everywhere and really wide. I love it so much! I’d move to Holland in a flash, largely due to their child-friendly bike culture! Our second child is due early next year and this post has me dreaming of our next transportation options. I love the cargo bikes, so good for shopping! Three kids on a bike is just inspirational. And leg defining! What a fun piece! Loved reading each family’s story! We’ve been married for 12 years, but no kiddos. We have a Cannondale Tandem that we’ve use for years. It’s amazing how many folks will stop and waive at us as we ride through the Pennsylvania countryside. It brings joy to people who see us, and to our marriage — he can’t ride away from me, and I can see the scenery! Win-win! :) we often recommend it to our couple friends. this is an amazing post!! very inspiring! 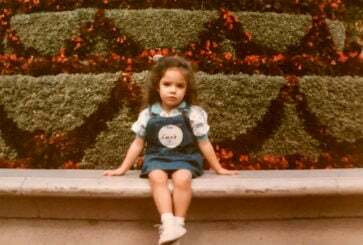 my husband and i live in LA without a car (we ride our bikes and use transit) and it is an ongoing conversation we have, do we want to have kids here or do we want to move somewhere else where is possible to have our lifestyle and kids at the same time. 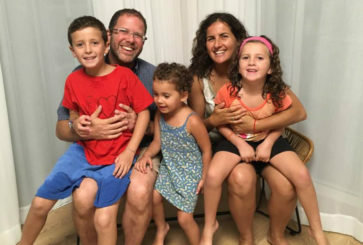 it is nice to see there are parents here in the states changing that for us :) i’m sure there are a lot more parents out there like these awesome families you interviewed. thank you for sharing! I just devoured this post. Love the pics and back stories. I sent this to my husband (an avid cyclist) and I’m now 99% sure an Xtracycle is in our future, haha! I have been riding a family bike here in Seattle for a year now, and it has been life-changing! I ride a turquoise Xtracycle cargo bike we have lovingly named “Blueberry” with my 4 yr-old son and 2 yr-old daughter in tow. We bike commute to preschool, parks, beaches, and shops, all via the Burke-GIlman Trail, an awesome paved bike trail that was once a railroad. Family biking has so many benefits…we get more fresh-air and outdoor time, more interaction with neighbors and passers-by, and hauling 2 kids is pretty great exercise too :) I’m so glad you’re spreading some family bike love! 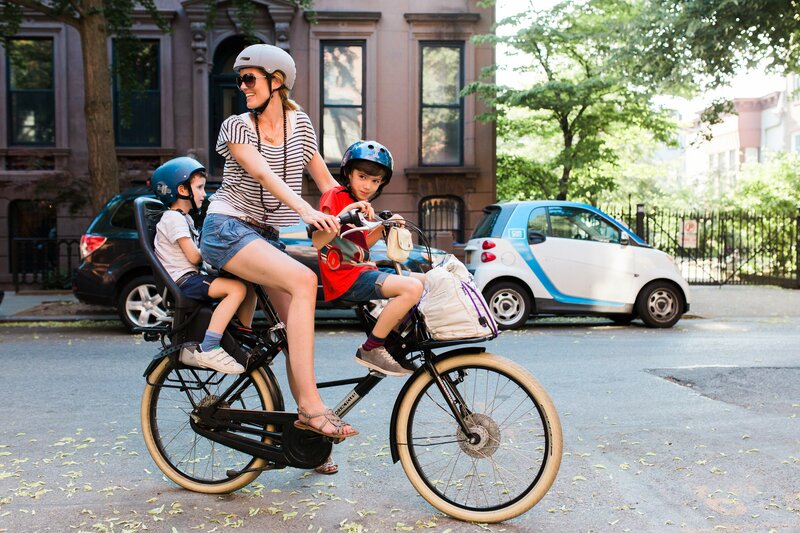 So fun to see family bikes featured! We own an xtracycle (got rid of our car 10 years ago) and ride (almost) year round in Chicago with our two kids. I would love to see more in-depth interviews with families living “alternative” transportation lifestyles. Now I want to go on a bike ride around town! It looks fun and a little relaxing. We have a Yuba Mundo that my 4 yr old calls “the skinny limo” and I call our minivan. When you did that post a few weeks back about biking in the city, I almost commented to suggest you check out cargo bikes. Our entire family can get around on one bike- it’s great. Plus, if I just have the two kids, I can pick up our CSA or stop at the grocery store. We never drive anymore! We just moved to CO from Boston and I was so bummed about the idea of driving everywhere due to a lack of public transportation, but now that’s not an issue! Yes, great post! 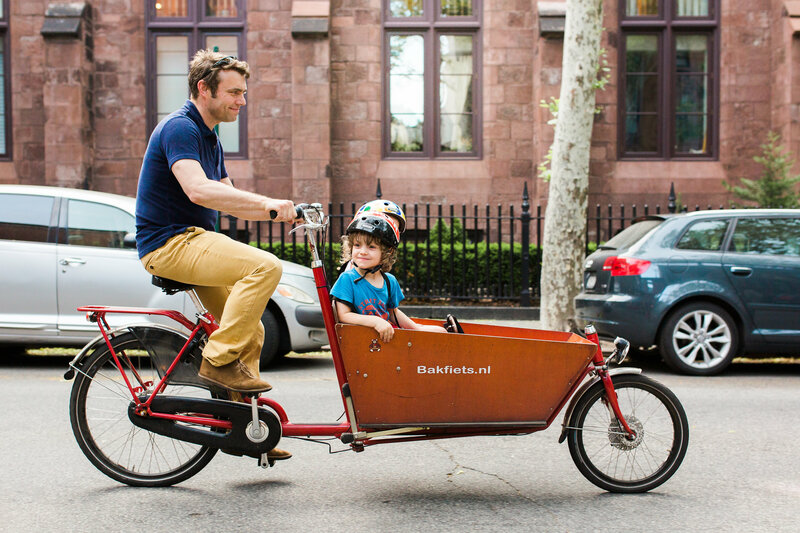 I’m interested in options that are easily transferrable between bikes – my husband and I use a Burley so that one of us can drop our son off at daycare and the other can pick him (and the trailer) up at the end of the day. this is my question too – I’ve never been thrilled on the trailer idea (too nervous without being able to see the kid) but we often switch off pickups/dropoffs so it would be more ideal to have something transferrable once our baby gets big enough to go in a bike seat. Right now I’m thinking we might just both get seats on our bikes. Before marriage & child I loved riding my bike! A girlfriend gave me her set of cruisers and one even had the child’s seat. I always thought I’d keep them forever in my parents garage! Then my parents decided to have a garage sale when I was moving out (getting married) and my dad sold my bikes!!! He assumed I wouldn’t want to drag them up to Northern California. I was devastated but I chose not to make him feel bad. After all He did give me the money he got at the garage sale (but those bikes have never been forgotten!). I must retell my husband this story & share your post so bikes will be in our near future! 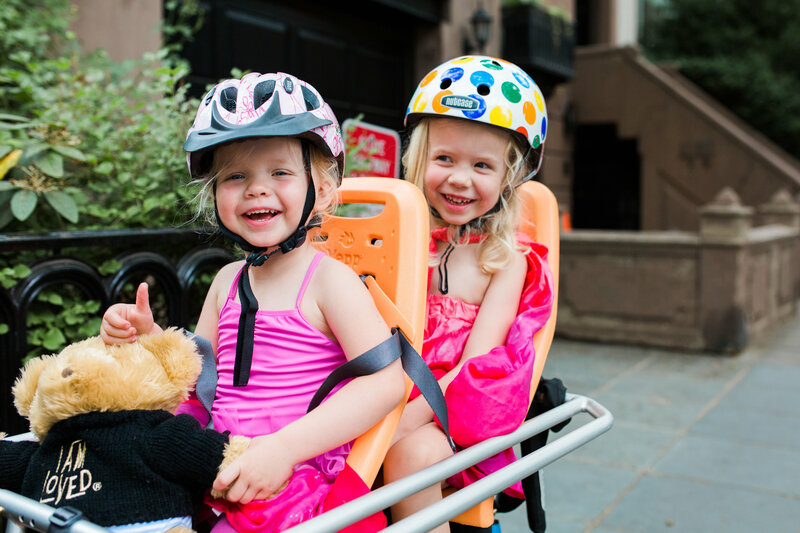 This is so helpful…my kids are getting too big for their bike seats (5 and 3 years old) I was wondering what to do next because i still want to bike with them (even thought they can both bike on their own). We bought a Weehoohttp://rideweehoo.com/ second hand and they love it but i don’t feel comfortable biking on Montreal streets because it is low to the road (great for bike paths though) . I think we need a cargo bike!! This was such a lovely post. I have to say though – it really bums me out when grown-ups don’t wear helmets! It’s such a bad example. For most of us our brains are our biggest asset and protecting your noggan should be a priority. when we visited Vietnam and Thailand we noticed whole families on motor bikes, which both freaked me out and fascinated me. i’d not a strong bike rider, i didn’t learn how to ride a bike til i was in 6th grade but the idea of being biked around is FANTASTIC. i will be honest, i’m trying to envision how they may add another kid or parent to the mix on some of these bikes, and i must be incredibly uncreative cus i’m not seeing it. We moved to the Hague 2 years ago when my son was 7 months old. I was nervous about cycling with him so it took me about a year to work up the courage to take him with me. But now we bike everywhere…. The Netherlands really is the safest place to bike in with its dedicated cycle lanes – the fact that most vehicle drivers ride bikes themselves make them very aware of other cyclists. This is very interesting to me. However, as someone who barely feels stable enough biking her own self, there’s no way I could ever manage multiple, let alone one child! These are very fun. We biked to school back in the day but used a tag a long for the younger and had the older ride his own bike. Then they both had their own. These “older” kids must be MUCH smaller than mine are. By 9, my sons were over 5 feet tall. At 13 my oldest is 6’2″. But, in Chicago they have classes for kids to take that teaches safe city riding for commuting. So if your kids are huge like mine and these are just not an option for very long you could look for that in your area. This is perfect timing! We JUST purchased the Yuba Boda Boda this weekend and we are squeezing 2 kids on the back (ages 4 and 2). It is SOOOOO much fun! I’m considering biking to work now after I drop the kids off at preschool. The bike was MUCH easier to peddle around with kids than I ever could have imagined. I could never do that in the city. Never ever. Turning a corner on such a big bike in NYC traffic terrifies me. Yikes. I had a seat on the back of my bike when my son was little, but after age 3 he was way too heavy and he would get bored and start hollering. We tried giving him toys to play with, but those just became projectiles, as did his hat and mittens. No bueno. I love bikes and I live in the city too, so we are really focused on letting the kids to ride on their own. They’ve both been off training wheels for a while now and they’re both really good. I regularly let my 7 year old ride on the street in front of me in areas with less traffic. They can both ride on the sidewalk until they are 12 and once we get there we’ll definitely have them on the road with us. Right now, I lead from the road and they ride on the sidewalk and my husband brings up the rear on the road, while keeping an eye on them. We let them ride around the neighborhood without us when we go visit friends upstate. I really valued the freedom bikes gave me from age 7 on. I want my kids to have that too. I love this! I ride a Yuba Boda Boda (http://yubabikes.com/boda-boda) here in Chicago. My five year old is the standard cargo, while her eleven year old sister rides her own bike, but I have been known to ride them both. We have the best conversations riding through the streets. We try to use the bike as much as possible — with a panier, a giant basket, and kids willing to wear their backpacks while we ride, we use the bike more than our car for school trips and errands. We got the bike last Spring, so I’m hoping that we can keep riding into cold weather. Mindy, come join our Facebook group Chicago Family Biking! We have an xtracycle in Milwaukee. There are others here but not many so we get lots of positive attention. There’s a great network of bike paths and lanes in our area so it’s easy to get around. I can haul a ton of stuff or a few kids (Pick up a preschooler for a playdate on the bike and you will make their day!). And, I get exercise and fresh air while we’re out having fun or running errands. We love it! 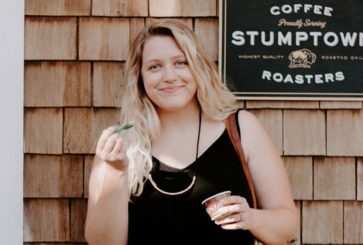 Hi- I’ve been reading your blog for the last 4 years, and I have to say that this is my favorite post ever! Thank you for showing so many different bikes. Would it be possible to do more in-depth interviews (like in the Motherhood Around the World series) of each family? It would be awesome to hear how they store, lock, and care for their bike, or what kind of gear do they use (regular clothing?). Thanks again! I second this – would love to see that as a series! My husband and I ride our kids to school most mornings…they are 9 and 6 (so this wouldn’t work until they a bit older) and because we live in the suburbs of Los Angeles, I am not comfortable letting them ride their own bikes solo (traffic issues). However, we’ve found Trail-a- bikes work well. Basically, they are 1/2 bikes (one wheel) that are connected to an adult bike with a tow bar and therefore the kids can help pedal but the adult in the front is “driving”. They also have a large tall flag attached so you are very noticeable to car drivers. They kids absolutely love it and they get a lot of attention from passersby. We get to do it nearly year round because we have mild weather here :). I can’t figure out how to link a pic here but if you Google the term “trail a bike” you can see the images. Here in Minneapolis, I’ve had an iBert (a front seat) since my oldest was ~1 and now he rides independently, my middle is on a trailer bike and the toddler’s in the iBert. I love it for riding our beautiful lakes and trails, and will be sad when they’re all too big to ride “up front” with me. We have a bakfiets and it’s really fun. 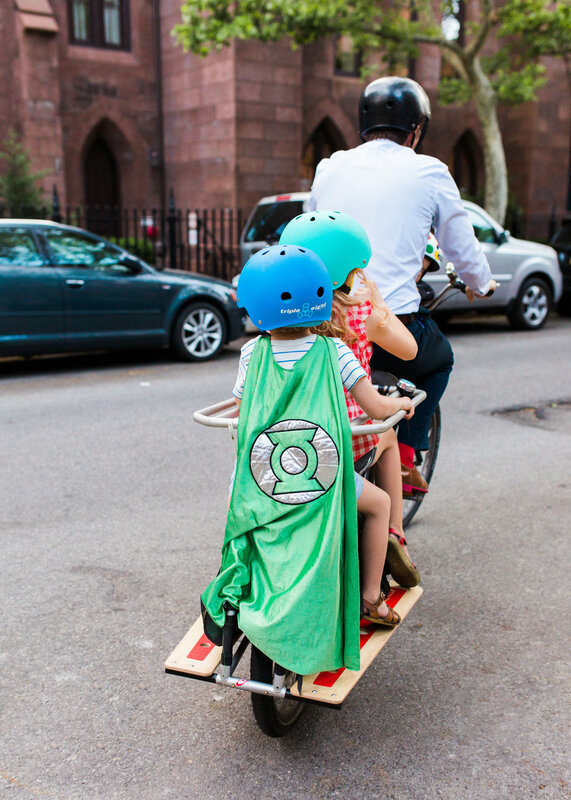 My kids love riding in it – even my 6 year old who is capable of riding around town himself prefers to go for a ride in it. I do have to say though that although it is very easy to ride and navigate I do have a hard time getting started on a big hill when it’s full of cargo (or kids). It’s definitely best suited for a more flat landscape. Amazing! Joanna, your biking post a few weeks back inspired me to get a city bike to ride with my three-year old. Love the bike, but the extra 25 lbs in the back really were throwing off my balance, so I practiced some figure 8s and then loaded some weights in a backpack into the child seat and practiced that ( in our underground parking garage mind you ;)) It all comes back so fast! Kudos to these awesome parents! The extra weight makes the balance so different! I’m glad I’m not the only one needing practice. :) Going to throw some weight on and try those figure 8s. Thanks, PNID! Love this – just got our little guy on dad’s bike with a rear seat. We live in the DC burbs and cycling is a huge part of my husband’s life. But here’s my question – where are these people storing their bikes?!? Living in NYC doesn’t exactly permit large garages, right? My husband has wanted a bakfeits for years and I’d say “when we have a house with a garage”. We bought a little townhouse (largely due to the kiddo’s arrival) but no garage yet. 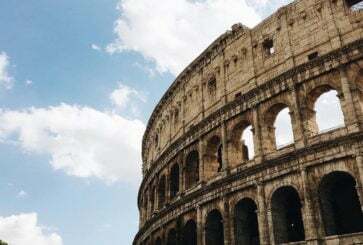 Both for weather and security concerns – how do they make it work? I’d love to know! What cool bikes! 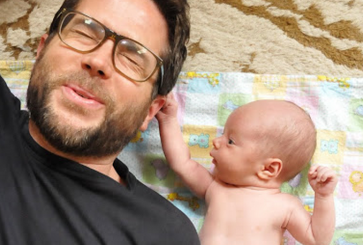 My dad used to do this with me and I loved it! Ack! 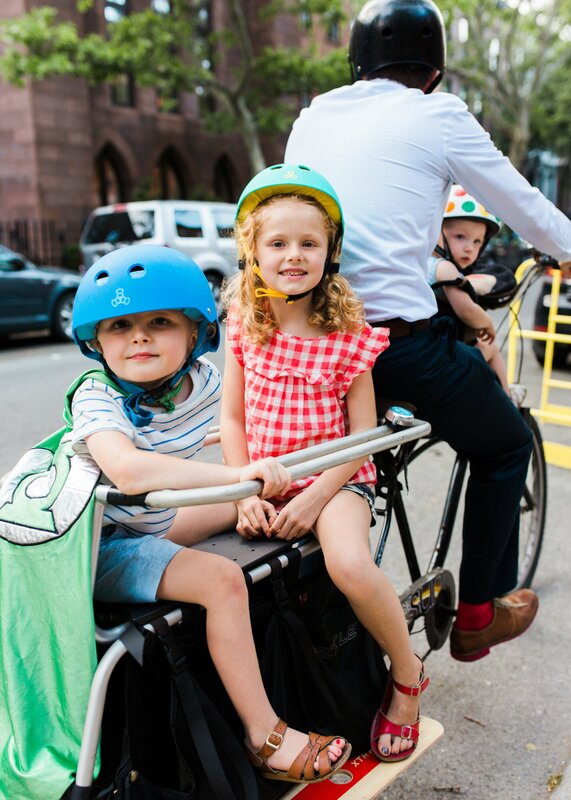 I know far, far too many people who have been in extremely close calls in bike accidents — and one close family member who died in a bike accident — to ever be able to imagine putting my children in a bike on city streets. Even in cities with drivers that are very used to cyclists, such as my own (Cambridge, MA) or New York, the infinite possibility of injuries is enough to keep my feet firmly planted on the sidewalk. All the power to the families who do it, but I’ll stick to public transit, walking, and the occasional taxi for my (future) family. I totally agree! My fear of motorcycles extends to bicycles (in traffic). Until there are bike lanes on roads, I am in favor of taking your bike to the park before getting on and riding. Bike riders can be extremely arrogant where I live…they don’t realize (or don’t care) that they are putting themselves and me in danger when they are riding on winding roads without a clear view of the cars coming around the next curve! I’d ride in NYC (actually I have!) before I’d ride in Cambridge or Boston ANY day! There may be plenty of cyclists in Boston but the drivers are NOT considerate of them at all. I am scared to put my little on my bike even though I was an avid cyclist right until she was born. The “funny” thing is though that (at least where I live: Toronto) it’s still statistically safer to be a cyclist than a pedestrian. Maybe next summer I bite the bullet and buy a cargo bike. All the parents at my daughter’s daycare ride them and it would be so much more pleasant than taking the bus. I’m pretty sure my daughter would do anything to ride in the cargo tricycle. There’s been a bakfiets here and there around Palo Alto, which is exciting to see. I hope it becomes more common. looks like some great family time! We live right next to a bike path in the country. It was an old railroad track and we have two small kids. And like Megan, I don’t feel comfortable biking alone with a child, so I love that these bikes are built for 2 kids or more. So my husband can ride with them or we go as a family! Great article! You may want to correct the cargo bike reference though as the Bakfiets is in no way a tricyle. There are tricycle cargo bikes out there, but the Bakfiets is not one of them! That looks amazing! I like that the one parent mentioned how his kids will still fight on the bike ride just like if they were in a car. I was wondering if you would still be dealing with tantrums/crying/fighting on a ride home if you were in a bike! Love this! Bikes are my husband’s hobby/passion, and we are expecting our first child in January, so this is very inspiring to me! BTW, Marte makes me want to bike my kids around just so I can look as great as she does! Can’t imagine what a workout that is! I don’t know what part of Colorado you’re in, but I’ve seen some extracycles at the Bike Depot in Park Hill in Denver. saw them in a bike shop in durango! Thank you so much for sharing! I ride with my children in Toronto, with my six-year-old on a trail-a-bike and my nine-year-old on her own. We have a growing network of bike lanes which make it feasible. People are generally very positive, though I get the occasional comment from someone that it’s not safe to have my kids on the road! I love seeing other parents biking with kids and making it work. So true! Toronto isn’t as bike friendly as it could be. I rarely bike because it scares me, but my husband used to be a bike courier so he feels very comfortable taking our 2 year old to and from daycare. He gets rude comments and deals with aggressive drivers every week. Soon he’ll be taking our baby to daycare too, using a bike trailer. The idea of riding around on one of these in NYC with children just makes my heart stop. It looks wonderful, but the possibility of disaster is just too real to me. Sorry to be such a Debby Downer! I know… that’s what I kept thinking! To each their own of course, but I just keep imagining scrapes and worse. Not all of NYC/Brooklyn is as congested as Times Square or Fifth Ave. There are lots (LOTS!) of streets that are quite sleepy and quiet that are a total pleasure to bike through. i see lots of these parents in park slope in the mornings. it’s inspiring! i just hope de blasio keeps up the maintenance on the bike paths that bloomberg worked so hard to create. we need those to get more cyclists in NYC, and we need more cyclists to make the city a safer place to bike. Prudence I was like you–always jealous of the freedom of people I saw on bikes, but way too scared to try! Then I married a guy who loves bikes more than almost anything, and thankfully, he’s a really patient teacher, as well. Now I love riding a bike! I can only imagine what it’s like to bike in New York. Still it is an odd view for me to see 7-year-olds in bike seats. In Germany we just let the 5-6 year olds (or even younger ones) ride on the sidewalks alongside their parents who are on the street or bikepath. I also never learned to ride! I thought I was the only one. You should try learning to ride on grass. That is how most of the kids I grew up with learned, including myself. Also, balancing is MUCH easier when you’re going faster rather than riding suuuper slow. Momentum helps keep you upright. I’m not an avid rider but I have ridden in lots of cities when travelling and it’s a great way to see a new place. 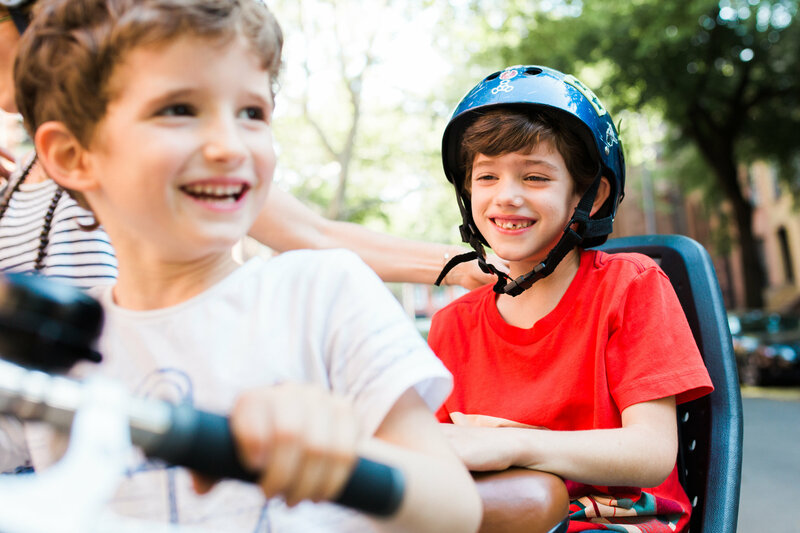 we ride an Xtracycle around in Minneapolis, and although we always seem to see a lot of other families who have them – it always gets people’s attention – and its a great conversation starter! As a family, we take it up to the beer store – all four of us on board! we LOVE it! great article, Jo! I love these! I currently pull my kids around in a Burley trailer but I wish we had something like this. It’s hard to talk with them so far behind me. These seem much more fun and engaging! Gosh, I’ve never even seen bikes like those, they look so much FUN! Not sure I’d attempt them in NY traffic, but then if you’re a competent biker and a native New Yorker maybe it wouldn’t faze you…? 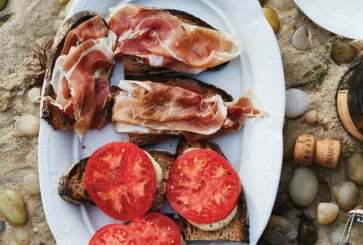 What Food Do You Pack for the Beach? Have a Lovely (Long) Weekend.